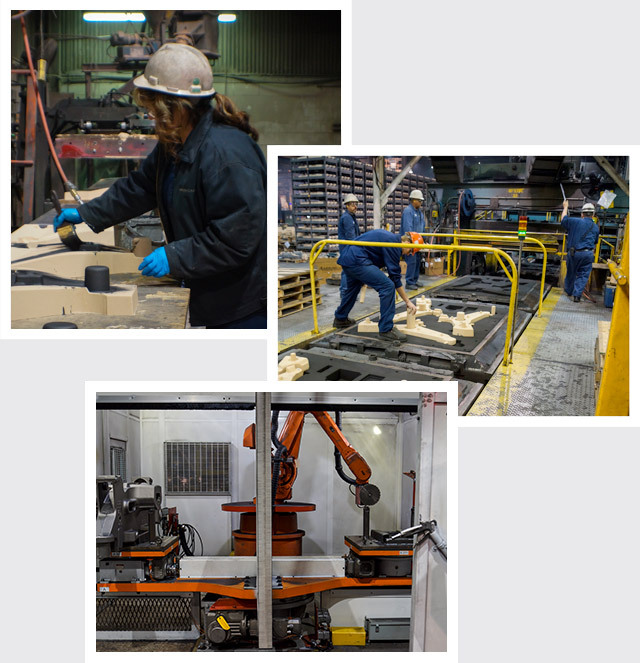 Career Opportunities at Aarrowcast | Iron Foundry in Shawano, WIAarrowcast, Inc.
Aarrowcast prides itself in its devotion to exceed customer’s expectations; however, we know that our employees are the core to our success. That is why we are committed to our staff and strive to achieve the best talent! At Aarrowcast, we care about our employees, and want to assist each team member to meet his/her potential. We know that no one aspires to remain in the same position forever, so we encourage growth, not only as an individual, but professionally since every Aarrowcast employee is an important asset to our team. If you would like to earn your degree while learning valuable on-the-job skills, we offer education reimbursement assistance to turn your education dream into a reality. Ready to work for a great company? Make your own path and join the Aarrowcast team today! Use technology to develop new parts and processes. Put your technical skills to work while increasing productivity by becoming a Robot Programmer or Operator. Maintain and/or repair machinery, equipment, physical structures and HVAC electrical systems. Use technology to control processes, inspect products, and improve quality systems. Wide range of positions encompassing production line, melt technicians, furnace operators, robot programmers and more. Use your talent to produce metal parts by making molds with sand, clay and water, and filling them with liquid iron. Operate furnace to produce liquid iron alloys at specified chemistry and temperature. Mix sand with chemical resins to produce cores, to be placed inside of the molds, to create hollow parts or passages. Assist grinding personnel by breaking off gating from castings and separating and cleaning castings using Pangborn and/or Wheelabrator machines. Grind and chip castings to bevel, round or straighten edges or remove excess stock from castings as specified by drawings, job orders or guidelines or to remove defects. Removing sharp edges or burs. Aarrowcast has been considered my second home for more than 29 years. I also have gained many new friends during this period. I started at a hourly position shortly after high school to find myself advancing to multiple levels from lead person to a department manager throughout my career. By pursuing a bachelor’s degree in business management I found a new career path in purchasing. I have seen many changes over the years, all for the positive growth of the company. Through dedication and a little hard work, others could follow the same career path. Coming from a different country, I can say that Aarrowcast received me very well and supported me adjusting to a new culture. All employees were friendly and cooperative. I worked hard and had opportunity to grow in the organization. It has been a challenge and a lot of fun! It’s an amazing feeling to feel appreciated and told by your manager that you’re doing a fantastic job. I’ve never experienced a manager that greeted each of his employees one-by-one to say good morning and provide a word of encouragement to have a record-breaking day. The pay is pretty good, and the work is fast paced. My coworkers are all friendly and willing to lend a helping hand when needed. Everyone is full of personality; you’re guaranteed to smile/laugh daily. There are many opportunities to climb the ladder, and there are good benefits, like earned incentive days. Aarrowcast also offers employees awesome programs, including employee discount to a fitness center and three free counseling sessions (EAP). Getting the opportunity to learn different jobs in other departments, along with the different benefits and incentives makes me come to work every day. Aarrowcast allows employees to learn all aspects of the foundry work, and provides other job opportunities, advancement and on-the-job training. Aarrowcast is a very stable and consistent job with many job advancement opportunities. It is also a very good company with good benefits and is very safety orientated. I was interested in working at Aarrowcast because of the challenges of dealing with something new every day. If you stick with it, it’s a very rewarding job in the long run. I also like working with the people that are here. © Copyright 2019 Aarrowcast, Inc. All rights reserved.